Bishop Danny Yohannan talks about the power of loving others through the supernatural ability of Jesus loving through us. What have you found is the most effective way to share Christ with other people? Let me tell you a story. The other day, it was raining outside, so my family and I decided to go to In-N-Out for dinner. On rainy days they always give the kids who are there free hot chocolate. I’m always interested to see what Bible verses they put on their food containers—they have verses on the fry holder, the burger wrapper, the milkshake cup, everything. This is amazing! Even at a burger restaurant we are being reminded to love one another. This verse is one of the most important passages in Scripture for a lot of reasons. Jesus is telling us the whole world will know we are His followers if we simply love one another. This is the greatest witness we could give to other people—and, I believe, the most effective way to share Christ. In one way, it’s far greater than literature and apologetics and programs, because it’s life begetting life. Now, don’t take that to the extreme and think that there’s no need to do anything else; that’s not true either. But we can’t really be an effective witness in our marriages, in our families, in our work or in anything else unless we are doing it with this heart and mindset. Can you clarify for us exactly what it might look like to “love one another” in the way Jesus was talking about? I think a lot of times we read this passage and 1 Corinthians 13 and others, and we think,Okay, that’s the good Christian thing to do, so we’ll just kind of try to be a little nicer and maybe do a random act of kindness here and there. That’s good, but that’s not the full picture of what Jesus is talking about here. You can be nice, have good manners and everything else without knowing the Lord at all. I know some very nice nonbelievers, and some of them are better-behaved than other Christians I know. But what Jesus is talking about here, which we maybe don’t fully realize, is that it’s the same thing He prayed in John 17: that His disciples would be united in oneness as He and the Father are one. The love within the Holy Trinity is an example of perfect love and submission. Think about the Incarnation for a second. God became man. A lot of us have grown up believing that the main reason Christ came was just to be the sacrifice on the cross, so the Father could kill the perfect lamb in order to appease His wrath brought about by our sin. But that perspective is a bit off. The true reason for Christ’s coming was because of His perfect love. It was completely in love that the Father sent His son; in love that Jesus went to the cross; and in love that He took on death and healed us of our disease, which had separated us from our relationship with the Father. When Adam and Eve sinned, God could easily have re-created mankind. But He didn’t do that. Instead, out of complete love for us, the Father sent His Son to make a way for our healing and restoration with Him. This is the kind of self-sacrificial love Jesus was talking about when He said, “As I have loved you, so you must love one another.” It’s a deeper love that He is calling us to walk in. It sounds impossible for any of us to reach that standard—am I right? What Jesus is calling us to do is impossible in our own human strength, because what Jesus is saying is for us to love one another with His supernatural ability so that others will see something different than what is in the world. Christian love is not about being a “better version” of the world’s type of love—being a more-behaved person or a better husband, wife or friend—though we are called to do those things. It is something that is so different from the world that it will capture people’s hearts and eyes when they encounter it. We know from history that Christians would often gather in the catacombs or in houses, and they would live out what Saint James said in his epistle: “Confess your sins to one another” (James 5:16). They would get together in groups and start confessing their sins aloud. Can you imagine what that must have been like and how much love and trust that would take? If you give away sensitive information about yourself—like the sins you’ve committed—they can take that information and use it against you. But the love among these Christians was so strong that they could trust one another that much and confess their sins openly to the whole group. That’s incredible and shows that it’s not impossible. This kind of deep love for one another only happens through an internal change, something on the inside that takes place by the power of the Spirit as we submit to His will. It is not automatic, but as we are purposeful in seeking the Lord, we learn more of what it means, and we grow into it. What are some practical steps we can take to move toward that kind of supernatural love? There are many practical things we can do. In fact, most of the epistles were written as corrective information for the Church about how they lived their lives together in love for one other. If you look at the epistles, you’ll see it is not mainly theology, though that is there, but it is basically the Apostles correcting what was happening in the life of the community of the Church. How often the Apostles told us, “Fight for unity,”1 “Love one another,”2 “Get the two people to talk together,”3 “Stop fighting.”4 These are all instructions for us to follow so that we can grow in what it means to love one another. But like I said before, we won’t get anywhere if we do it in our own strength. We must recognize that this is something we can trust the Lord to do in our lives. It’s not about looking back and feeling bad about areas where we have failed and just hoping that we will change going forward. There is a time and place for us to reflect on wrong things in our lives and seek to change them, but when it comes to loving like Christ, we have to trust the Lord will do His work in us as we seek Him with all our hearts. God will give us the grace for that. As we grow in this, our very lives will proclaim the love of God to the world, whether we are at work or at the grocery store or the gas station or anywhere else. I pray God will encourage your hearts as you seek to truly love one another. In this way, the world will know that we belong to Him. UNITED KINGDOM – Christians in the UK were encouraged in their walks with the Lord last November by a visit from Dr. K.P. Yohannan, founder of GFA. In his short visit, Yohannan reinvigorated supporters by sharing inspiring reports and stories about the work in Asia. The GFAUK office organized events in London and Manchester. Yohannan also ministered to hundreds of people as he spoke to three congregations and did an interview with UCB Radio. GFAUK is a tiny cog in a big wheel, with just six staff members and a small team of volunteers. Yet through their faithful service from Manchester, England, God is changing lives in Asia. Meeting to pray often, the UK team is very conscious that they need the Lord to work. And He is answering. Faithful supporters give their prayers, their resources and their time. And Yohannan’s visit was an opportunity for them to hear how God is using their sacrifices and gifts. Rachel works near the UK office and often gives up her lunch hour to help with simple administrative tasks at GFA. Reverend Paul Blackham, chief executive officer of Biblical Frameworks, also attended an event. Yohannan’s visit was a breath of fresh air to faithful brothers and sisters making sacrifices from far away, without ever seeing what they are accomplishing. God is mightily at work, and in God’s economy, even the small things make a very big difference. USA – GFA behind-the-scenes missionaries and School of Discipleship students helped process nearly 40,000 Christmas shoeboxes during their volunteer shift at Samaritan’s Purse Operation Christmas Child (OCC) processing center in Dallas. From 10 a.m. to 4 p.m. on Dec. 2, 17 GFA representatives assembled in the warehouse with hundreds of other volunteers to inspect, scan, fill and prepare gift-laden shoeboxes for shipping to children in need around the world. About every hour, they paused to listen to stories of how children had been impacted through these Christmas gifts and to pray over the boxes. Rebecca, a GFA behind-the-scenes missionary, recalled a story about how a young girl at an orphanage in Ukraine received a Christmas box that contained a most treasured gift: a toothbrush. During the volunteers’ shift, a truck loaded with boxes they had just processed began its journey to Mexico, where hundreds of children would be blessed with gifts in time for Christmas—and hear about God’s great love for them. This is GFA’s second year volunteering at OCC’s processing center. By working together with the Body of Christ, GFA is able to minister to the needs of people living in desperate conditions beyond Asia. NEPAL – Sixty elementary school students in Nepal received sweaters, socks and shoes after GFA-supported workers organized a special Christmas event at their school on Dec. 25. Most of the children’s parents work as day laborers and could not afford the necessary clothing to keep their children warm throughout the winter. The school’s principal attended the event and expressed his gratitude for the help given to his students. GFA-supported workers seek to partner with local people to help meet needs while ministering Christ’s love in tangible ways. Riots swept through the small village, bringing upheaval in every way. Those behind the riots began to extort the local businessmen, attempting to further their cause. Gair, as a dry-fish vendor, was one of them. The activists gave him an ultimatum: Pay a sum upwards of $60,000 or face the consequences. Gair refused; he did not have the money. He was murdered in his own house. He left behind a wife and four daughters. Amey, Gair’s widow, wondered what to do. To ensure her daughters’ safety and future, Amey began to sell her belongings. When money ran out and there was no more to sell, Amey decided to revive her husband’s business. Things started to look up as the business began to thrive. But others businessmen looked upon her success with jealously. They harassed the widow, even attempting to kill Amey. Amey found herself back at square one. This time, she didn’t know what to do. Anxiety, worry and uncertainty gnawed at Amey’s heart. What would happen to her and her daughters? Was there any hope at all? Who could help them? A neighbor of theirs, who often helped the beleaguered family, suggested Amey and her daughters attend church services led by GFA-supported pastor Maran. When they visited, the believers instantly welcomed the widow and her daughters. Amey immediately felt peace. Soon after, the Lord inspired her to open a spice business. The new venture, blessed and prayed for by the pastor, brought in the much-needed income to support Amey and her daughters. As a pastor’s wife, Aaloka walks a delicate balancing act of serving her husband and children and actively sharing Christ’s love with others. She has learned not to take either privilege for granted. Although being a wife and mom is a huge part of Aaloka’s life today, she knows what it’s like not to have a family around. She lost her mother at a very young age, and when she was in fourth grade, her father dropped her off at an orphanage. Later, he passed away. Even though Aaloka’s father wasn’t present during many of her formative years, her heavenly Father was. She learned about Him when she attended a local Sunday school during her years at the orphanage. As a young woman, she met some women missionaries who shared Christ’s love with her. Desiring to know more about Him, Aaloka joined a Bible college, where she decided to serve Jesus. Following graduation, Aaloka served in a team of women missionaries for five years before she married GFA-supported pastor Shorya. Although busy raising their sons, Aaloka continues ministry alongside her husband. She joins him sometimes as he visits and prays for people in different villages. She also leads the Women’s Fellowship in their church and teaches Sunday School. But it hasn’t always been easy for Aaloka to navigate life in light of her calling to serve her family and to share Christ’s love with those who don’t know Him—especially when her family’s safety was at risk. In one village Pastor Shorya visited, some people rejected the message of hope he offered. Multiple times, men came to the couple’s house looking for him, and Aaloka feared they would physically harm her husband. This time of opposition wore down Aaloka. She struggled, wondering if her husband would be killed. She asked him what her future would be if the worst happened. Did the Lord really want him to keep visiting this village at such risk? Together, the couple fasted and prayed for three days. “If it is Your will, then change the heart of the people … so that we can continue Your service over there,” they prayed. Not long afterward, the Lord made it possible for Pastor Shorya to return to the village. Now there is a congregation there. Grateful God gave them courage to continue, Aaloka prays she and her husband will see more lives touched by Jesus. Aaloka continues her delicate balancing act. She goes with women from her church to share the hope of Christ in nearby villages, and she faithfully supports her husband in ministry and teaches her sons about the ways of the Lord. “My desire is [that] we as a whole family … should serve the Lord,” Aaloka says. For this busy wife and mom, the sacrifices and risks are worth it if more people will know Jesus. With my heart pounding with anticipation, fear and excitement, I walked through the doors of the airport and into a whole new world. This was it! After several months of prayer, planning and unknowns, I had finally arrived in Ontario to begin my year at GFA’s Discipleship Program in Canada. That day was kind of like a point of no return in my life. Even though I had no idea what lay ahead for me, I knew God had placed a longing in my heart to know Him more, and I could not be satisfied with anything less than obedience to His call. That assurance was what I kept going back to time and again in the days that were before me. Discipleship Program is not easy. It is not a place you go to just to get away, have fun and learn more. It is about life-transformation, living out biblical Christianity in everyday life and following the example of a community committed to walking with Christ. An aspect of the program that significantly impacted me was community life. One of my first memories was arriving at the house that would be my home for the year and finding out I would be sharing a room with three other girls. This was definitely out of my comfort zone! Over the course of that year, what at first seemed so overwhelming for me became a precious opportunity to experience fellowship as part of the Body of Christ in a way that I never had before. We girls did everyday life together: eating, sleeping, learning, crying, laughing, praying and sharing in the joys and struggles of our journey with Christ. Community living required of me a level of openness and honesty that I never had before. It showed me that I don’t have to keep all of my struggles and failures on the inside. Learning to open up to other people also helped me realize my need to be totally open before the Lord. He showed me that deeper relationships both with Him and other people are only developed through trusting enough to reveal who I really am—even if it’s not always pretty. My experiences as part of this community continue to shape my life even beyond Discipleship Program. I have learned that as a follower of Christ I am not meant to do life on my own. I need others who are willing to walk on this journey alongside me. My desire is to, in return, seek to invest in the lives of those around me, living as a tangible example of God’s love. “It is useless to send a girl to school,” Gnana’s father chided her. Gnana cried and cried, begging her father to let her go to school with her brothers, but each day Gnana and her sister were left behind as the three boys of the family trotted off to get an education. Being relegated to household chores and manual work left a deep longing in Gnana’s heart. Her father saw no value in educating his daughters. As soon as it was culturally acceptable, Gnana’s parents arranged her marriage and unloaded her from their care at the age of 14. The young bride had to adjust to married life quickly. Gnana became a mother before her first year of marriage was complete. By the time she was 16 years old, Gnana was a wife and mother of two. Even as the years swiftly piled responsibility on Gnana’s shoulders, a thread of joy ran through her days. 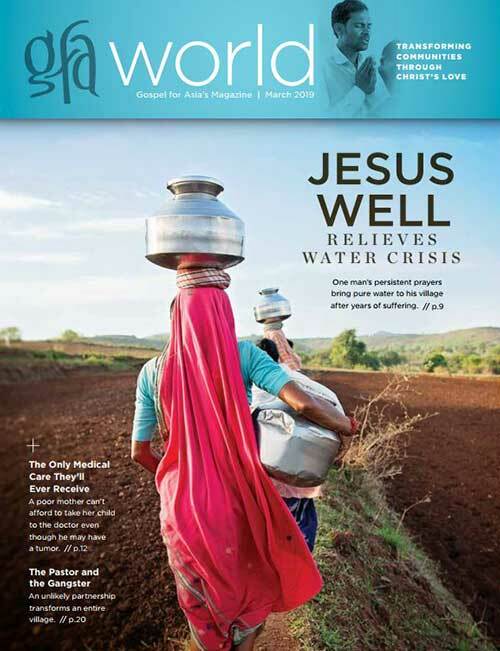 Being a follower of Jesus, Gnana prayed for her husband—who followed a traditional religion. By the time their second child was born, Gnana’s husband, in-laws and brother-in-law attended worship services with her. Gnana and her husband were faithful to send both their children to school—their son and their daughter. But Gnana still mourned the fact that she never had the opportunity to receive and education. More than anything, she wished she could read and write. When the Women’s Fellowship of Gnana’s local congregation started a literacy class, Gnana joined the class, excited that the longing of literacy, which had lived in heart for many years, would be answered. Arranging her schedule to attend the classes was challenging, but Gnana made sacrifices to faithfully attend. During class, Gnana paid careful attention to the lessons, and at home, she’d practice and receive help from her children when she was stuck. Because of diligent practice and the help of her tutors, Gnana can now write her name and her husband’s name, along with their address. She especially cherishes being able to read the Bible herself and hear from the God who has cared for her. Girls in Asia are often denied an education, condemned to a life of illiteracy. Without the skills needed for engaging in business and overseeing their children’s education, many women are taken advantage of. But Jesus cares for women and holds them in high esteem. Let’s pray that many women in Asia receive the gift of literacy and learn about the love of their Creator. In the first six chapters of the Bible we read how mankind was gloriously created by God, fell in sin and became so corrupt that God saw no other alternative but to wipe them out by a flood. Only Noah and his family were spared. It didn’t take long before mankind once again turned their back on their Creator and made their own gods. What exactly was it that caused the human race to end up in such tragic deception and live in its bitter consequences? The first three chapters of Romans paint a vivid and painful picture of how it happened and why. In spite of the knowledge God put in people’s hearts and the clear revelation of His attributes, majesty, power and divine nature seen in creation, men, by their own will, chose to suppress the truth and create their own gods and spiritual value systems (see Romans 1:18–23). Their departure from the Living God was not out of ignorance or accidental; it was a deliberate choice. We find the underlying reason in this Scripture: “There is no fear of God before their eyes” (Romans 3:18). Paul even spoke of Christians who had created another Christ, a christ that suited their imagination. People’s cultures have a lot to do with the creation of deities, whether they are graven images, philosophies, materialism or self-elevation. When I had to take a course about higher criticism in Bible college, I was amazed by how many horrible beliefs came from people interpreting Scripture based on their own cultural behavior. With it they justified their twisted actions or at least obtained permission for them. What is it about the fear of God that makes it so important for us to have? The fear of God is our only protection from making our own gods and walking off the same cliff into sin and depravity, like the people described in Romans did. That’s why God told Moses to let the Israelites experience His awesome presence and hear His voice at Mount Sinai: “…that the fear of Him may remain with you, so that you may not sin” (Exodus 20:20). The fear of God is a deep reverence, respect and honor from the heart for our Creator, which translates into us worshiping and serving Him only and doing His will. It positions us to experience God’s favor, blessing and protection (see Malachi 3:16–18). The Apostle Paul speaks about the importance of “perfecting holiness in the fear of God” (2 Corinthians 7:1). We cannot grow into christlike maturity and godliness without having the fear of God in our lives. So how do we develop and grow in the fear of God? In our present culture, respect and honor are words that are difficult to explain. For the most part, they describe past generations where husband and wife were loyal to each other, children didn’t dare talk back to their parents, students stood up when the teacher walked into the classroom, and people upheld promises made with only a handshake. Today 50 to 60 percent of marriages are ending in divorce, families are breaking down, young people are messing up their lives, children are defiant, and a promise given to someone has no meaning. We may have never been taught how to show respect to anyone, including God. So we come into His house with a casual attitude and attire fit for the movies or the beach, chewing gum, talking, joking, checking our iPhones and texting during the worship service. All the while, the angels in heaven fall on their faces before Almighty God and cry “holy, holy, holy.” They do it because they know who He is. Knowing Him is the key to fearing, revering and honoring the Lord. We must seek to know God! How? James 4:8 says: “Draw near to God and He will draw near to you.” Jesus promises in John 14:21 that He will reveal Himself to the one who keeps His commandments and loves Him. Then, like Peter, James and John when they were on the Mount of Transfiguration, we will see His glory, majesty and the light that surrounds Him. It will create a deep sense of respect and reverence in our hearts that will totally change our worship and outward behavior when we come into His presence. We will be so aware of His holiness, majesty, power and love that we will forget our distractions and fall on our knees in reverence and desire to honor Him with all our being. May the Lord give you grace to seek to know Him in this way.